Last Saturday, the men’s soccer team faced off in a vital conference matchup against perennial NCAA tournament contender Bowdoin. It was a wild weekend of sports action, and the game kicked off around the same time as football. Despite the multiple sporting events of the day, over 300 people lined the sides of Jackson Field in hopes of seeing the first Bowdoin victory since 2014. From kickoff, the Cardinals pressured the Polar Bear defenders, creating opportunities all over the pitch. The Red and Black won the time of possession, keeping an emphasis on creating chances in both halves. Their knowledge of Jackson Field paid off in the fifth minute, as a back pass to Bowdoin freshman goalkeeper Owen Wolfson resulted in a Loris Karius-level howler. Wolfson wound up to kick, whiffed, and newly minted forward Mike Gallo ’20 made no such mistake. After blowing past Wolfson, he tapped the ball across the line to put the Cardinals ahead 1-0. It was Gallo’s second goal in as many games. Bowdoin regained its composure after the mistake and pushed deep into Cardinal territory on multiple occasions. After a few half-chances, the Cardinals earned a throw on the Polar Bear side of the field. 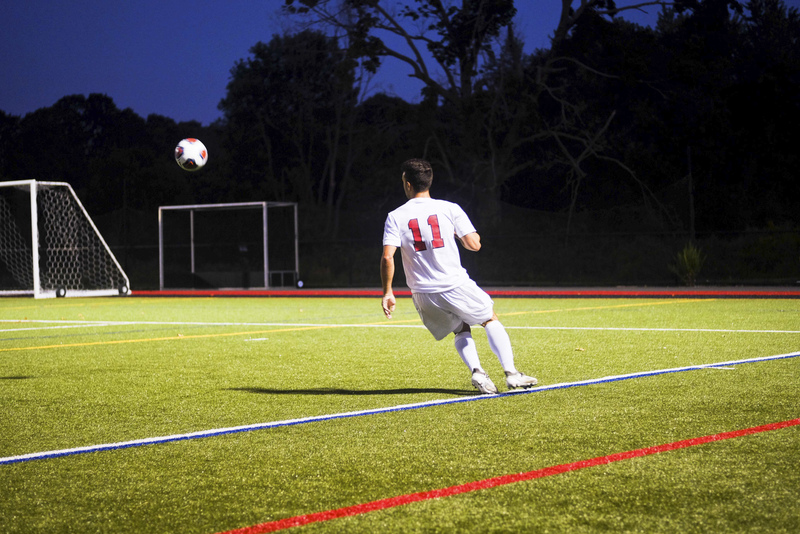 Any fan of the men’s soccer team knows the danger of throw-ins, especially with the throwing strength of Cards’ defender/midfielder Sam Serxner ’21. Clearly, Bowdoin missed the scouting report, and Serxner whipped an arcing throw high over members of both teams and into the six-yard area. Midfielder Lucas Kimball ’21 rose up out of the scrum and managed to flick a header onto fellow sophomore James Schubauer. “I saw the ball coming in, and I mounted the goalie and front post defender to get my head on it,” Kimball said of the buildup to the goal. Schubauer reacted before the Bowdoin defense, and before Wolfson knew it, the Cardinals launched into another celebration. For Schubauer, it was further proof that the Cardinals’ offense needs a bigger upfront push. The rest of the first half saw firm possession by Bowdoin, capped by a few clean looks and some solid shots. Goalkeeper Chris Franklin ’21 continued his impressive form, managing to make multiple diving saves to maintain the clean sheet. It was his second straight clean sheet, as his goals allowed average has dropped to .73 a game. In the second half, Bowdoin outshot the Cards 8-2 and earned more corners (2-0). However, the defense held strong, refusing to allow a goal. The game ended without anymore scoring. Wesleyan now has a 1-0 record in conference play and 2-2 overall. For a team that won only two NESCAC games last year, to start off the season with a win against a strong Bowdoin side marks good things to come. Conference games are vital, as last season, five NESCAC schools earned bids to the NCAA tournament, an incredible number. While the Cardinals currently have their mind set on an NCAA tournament appearance, a strong finish in regular season conference play can lead to games deep in November. Contributing to the Cardinals’ success has been strong play by a deep freshman class. First-years Nick Wallick, Spencer Robbins, and Jack Pironti all earned starting nods in the showdown versus Bowdoin. While the Cardinals were rained out this week versus Vassar College, another conference matchup looms against Bates on the road, tomorrow at 2 p.m. Last year, the Cardinals scored a season high of four goals against the Bobcats and look to replicate their performance and move to a winning record.